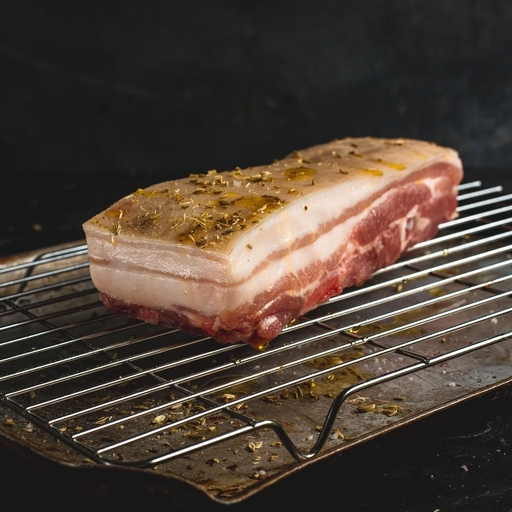 Fresh organic pork belly – a great value joint and chef’s favourite. Tender, tasty and rich, it’s a crowd pleaser of a roast. The skin crackles beautifully too. Served slow-cooked to melt-in-the-mouth succulence, this is one of The Riverford Field Kitchen’s most popular dishes. Serves 4. Preheat your oven to 220˚C/Gas 7. Season the joint generously on all sides. Roast for 20 mins, or until the skin has started to turn golden and begins to look like crackling. Drop the heat to 170˚C/ Gas 3. Add some liquid and stock veg to the tray, beneath the meat. Return to the oven and cook for 3 hours, or until the meat is meltingly tender. Turn up the temperature for a final 10 mins to crisp the crackling. Leave somewhere warm to rest for at least 15 mins before carving. Use any resting and roasting juices as the base for your gravy. Our pork comes from Helen Browning at Eastbrook Farm in Wiltshire. Helen set up her farm over 27 years ago. She’s a champion of organic farming and giving animals the best quality of life – in fact, she’s Chief Executive of the Soil Association and spends much of her time campaigning for better animal welfare. Helen’s organic breeding herd of 200 sows are pure British Saddlebacks - a hardy, native breed that thrive outdoors, make great mothers and produce great flavoured pork. Boars are Large Whites, a typical UK outdoor reared cross. They counter the fat levels found in pure breed Saddlebacks, but not enough to change their special flavour. Helen’s pigs live in fields outdoors in family groups with loads of space and fresh ground to rootle around in. Even in the coldest, wettest weather, the pigs seem happiest outside foraging in the grass, clover and mud looking for roots, bugs and other treasure. They also have dry, warm ‘arc’ houses with plenty of fresh straw when they want to be cosy. Piglets are born outside in their arcs and weaned later than in conventional (non-organic) farming, so they are robust and independent by the time they leave their mothers. If you want to see the pigs foraging for yourself, Eastbrook Farm welcome visitors to their farm for walks or guided tours. They also run an award winning pub, The Royal Oak. We choose traditional breeds, which we believe give better flavour. We carefully hang and butcher the meat ourselves, then mature it for extra flavour and tenderness.